Bladder Cancer Awareness Day was May 7, and we have special reason to be aware of this type of cancer. In 2006, my mom was diagnosed with bladder cancer. We thank God that she was able to have her bladder removed in 2009, but the cancer was not all taken out, which led to her having a kidney removed in 2010. It was a time when I learned a lot about surgeries, the bladder, and being a caretaker at home. It was hard to watch someone you have been taken care of suffer and struggle, but God chose to allow her to be here as Jordan joined our world. As of yesterday, she received the news she is still cancer free. This month marks 2 years. She has been such a blessing as she has been praying for, taking care of, and loving our little man. I am so blessed to call her my mom. 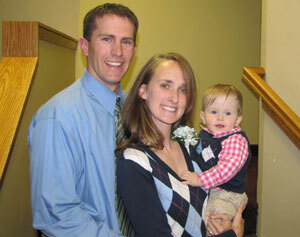 She also joined family members and friends as we had Jordan’s dedication at our church. It’s a time when we publically make a promise to God that Jordan is His, and that we pledge to raise him in a home that honors and trusts in His promises.